President Xi Jinping extended festive greetings to soldiers and officers of the People's Liberation Army (PLA), armed police, militia and reserve forces Saturday. 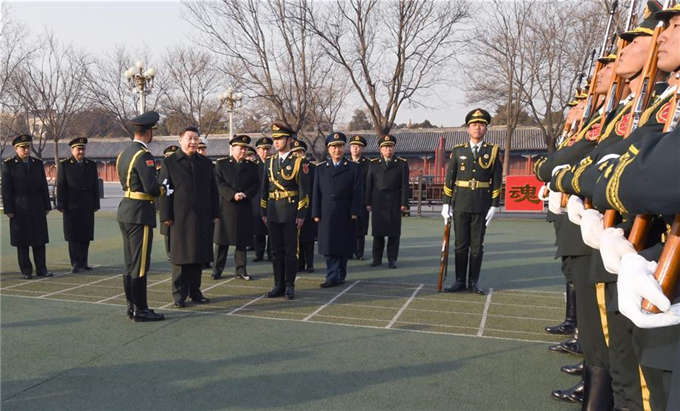 Xi, also general secretary of the Communist Party of China (CPC) Central Committee and chairman of the Central Military Commission (CMC), visited the PLA Beijing Garrison Command ahead of the Spring Festival (Chinese New Year), which falls on Feb. 5 this year. Around 9:15 a.m., Xi visited a unit of the National Flag Guard by a gate of the Palace Museum, and the dormitory of the officers and soldiers. Calling the flag-raising ceremony at Tian'anmen Square a significant national ceremony, Xi asked them to keep their duty and mission firmly in mind, maintain high standards and safeguard the dignity of the national flag with concrete actions. Xi then dropped in on a support unit of the Beijing Garrison Command and watched the soldiers' rehearsal of the performances for the Spring Festival celebrations. He also stepped into the soldiers' canteen and called on the garrison to ensure the soldiers a happy, harmonious and safe festival. Xi also inspected security guards on duty, discipline inspection work and the construction of an activity center for retired cadres. Noting that the Beijing Garrison Command was an important force directly commanded by the CPC Central Committee and the CMC, Xi called for efforts to implement the Party's thinking on strengthening the military for the new era, focus on combat readiness and reinforce guarding capability. Xi called on the military force to remain fully trustworthy to the Party and the people. He stressed construction and command of the army in terms of thinking and political orientation, noting that the army should firmly uphold the authority of the CPC Central Committee and its centralized, unified leadership, and resolutely follow the command of the CPC Central Committee and CMC. Xi asked the Beijing Garrison Command to efficiently perform their guard duties, well handle counter-terrorism and emergency response, ensure absolute safety of whoever they guard, and maintain the capital's security and stability. He also called for more efforts to strictly govern troops, improve their conduct and push forward the allround progress of primary-level construction.